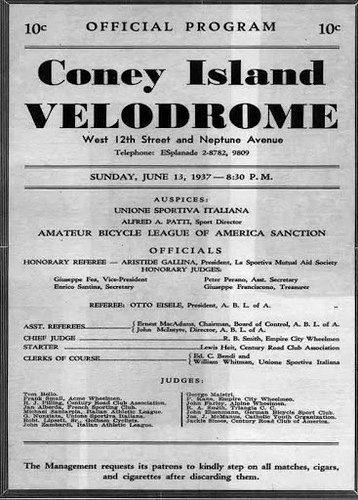 The news that philanthropist Joshua Rechnitz’s plan to donate $50M to build an indoor velodrome in Brooklyn Bridge Park was scrapped got us thinking: Why not build the velodrome in Coney Island, which had an outdoor one from 1930 until the 1950s? It was New York’s last commercial bicycle racing venue, according to NY Bike Jumble founder Harry Schwartzman, who curated an exhibit of bikes, photos and ephemera relating to the Coney Island Velodrome at Brooklyn’s Old Stone House in 2010. The New York Times reported on Thursday that Rechnitz and his nonprofit NYC Fieldhouse had withdrawn the proposal for Brooklyn Bridge Park due to high site costs and would seek another location in the New York Metro area for the sports complex. According to NYC Fieldhouse’s website: “As currently envisioned, a facility of no more than 115,000 sq. ft. will hold a maximum of 2499 seats. It will feature a 200-meter inclined cycling track, a boathouse, a 22,000 sq. ft. infield and other spaces that will serve various public uses including sporting events and community activities.” The gift was the largest single donation to New York City parks and would have covered the design and construction of the building as well as any revenue shortfall over the first ten years. The Coney Island Velodrome at 12th and Neptune was a ‘competition’ track where a typical race day would include up to twenty three events, from 100 meter sprints to 40 mile motor paced events where riders would shadow a motorcycle around the track at speeds upwards of fifty miles an hour. The track was built in the thirties, waning days of the popularity of bicycle track racing in the USA, and the sport was not as popular as it had been in the eighteen nineties or in the twenties, when stars, gangsters and celebrities would frequent the races. Coney Island’s audience would have been more proletarian and most likely recent immigrants from lands where bicycle racing was still popular. Cycling is still a very accessible sport, and track racing is even more so than any other discipline. With the explosion of the popularity of cycling, it’s the perfect time to bring back the Coney Island Velodrome! I represent a property that is the perfect location for the Coney Island Velodome. The 110,000 square foot area next to the Stadium. It extends from Surf Avenue to the Boardwalk. In addition to the Velodome why not build parking and a Hotel above it. You could also place retail shops and restaurants on the perimeter. This would be a tremendous boost to Coney Island and help to establish it as an all year round amassment and entertainment venue. Better still a casino.